Where do I begin. Saturday was a wasted day since I was sick and didn't get much sleep the night before. Bob took the kids to a birthday party while I drank some Kombucha and bone broth and took a nap. The magic 3 definitely helped. Since I didn't feel like cooking anything too involved for dinner I went with sausage and sauteed kale, cabbage, onion and diced apples. Yes, apple onion cabbage combo again. Although I didn't use a ton of cabbage since I was using kale as well. Just enough to give the dish some bulk. It was pretty good. Easy, cheap and filling. Nope, no pictures. 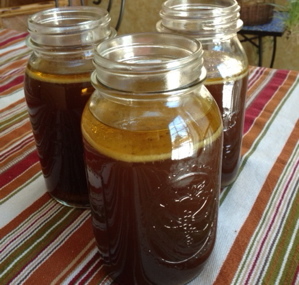 But, I did get a picture of my wonderful bone broth which we seem to be making about every other week or so. This was batch number one. Batch number two is ready and waiting to be jarred. Thankfully Sunday I was feeling much better and was able to get decent back squat strength work in at 155, 165 and 175. Heavy and felt like it. But, felt good to get it done. Didn't do any conditioning but did mess around practicing L and tuck sit holds. Ouch. If it didn't hurt my palms so much I may have been able to squeak out more than 10 seconds each time... even though 10 seconds seemed like an eternity. Later in the day I made some eggplant hummus and crackers. The hummus was just ok. I'm thinking next time I will roast the eggplant and garlic first. If you've ever roasted garlic before you know it adds that next dimension. Yes, I'm in the I spend too much money on gluten free pretzels and hummus so I'm going to just make my own mode. We'll see how long that lasts. How many different ways can you make meatloaf? Apparently, a lot. Sunday night for dinner was PaleOMG's sweet potato meatloaf. It was certainly different with the addition of raisins and cinnamon which was a nice change from the basic peppers, onions and mushrooms. And as an added bonus, my daughter loved it (but picked out the raisins) because it had bacon on it. The bacon on top was the kicker for me. Otherwise, eh, it would have just been ok. The 'you'll eat what we eat for dinner' is going well. My daughter will try anything and will actually eat a decent portion of it. My son however is going to test my patience. I'm not giving in though. He has tried a bite of steak, pork and meatloaf. Literally. 3 bites. Not enough to make an ant happy but, I'm hoping he'll get hungry enough to just eat and not argue with us. Not everyone enjoys every meal. Hell, I've made some craptastic dishes over the years but you eat and move on. Hopefully he'll get it sooner rather than later.